Brazilian telecom company adopts Intel® Node Manager, optimizing energy for capacity. Telefónica/Vivo is Brazil’s largest telecommunications company, providing over 91.1 million lines of access, of which 76.1 million alone are in the mobile operation. This makes it the largest market shareholder in the mobile operation industry in the country. The company provides fixed phone services in the state of São Paulo and ...mobile communication throughout the entire country. In all, Telefónica/Vivo is present in more than 3,700 cities (over 3,100 of those also have access to a 3G network), a number that exceeds that of the totality of cities served by competing operators. In order to improve service quality as well as its capacity for innovation, a new data center was inaugurated in Santana do Parnaíba (SP) in September 2012. For an initiative of these proportions, energy consumption is a decisive factor, which led Telefônica/Vivo to adopt Intel® Node Manager (Intel® NM) technology in order to enhance energy consumption management for each server, thus raising the processing capacity within the same area. The data center will store all of the company’s data as well as information concerning its almost 91.1 million clients. Far from being an ordinary data center, it is adopting the necessary procedures for the acquisition of the Leed* certification, an ecological certification label based on international standards and recognizing the project’s sustainable practices, notably its energy efficiency that is 25 percent above the world average as well as its rational use of water. 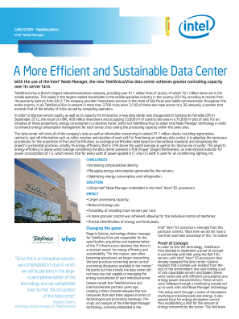 Read the full Telefónica/Vivo’s More Efficient, Sustainable Data Center.